Rather Special Hand printed Books. Peter and Frances Grant at the Hestan Isle Press print texts which are romantic, amusing, uplifting, or just hard to find. The books are letterpress printed by Peter and Frances Grant on the Hand-press from individual letters of metal type, and all are signed limited editions. 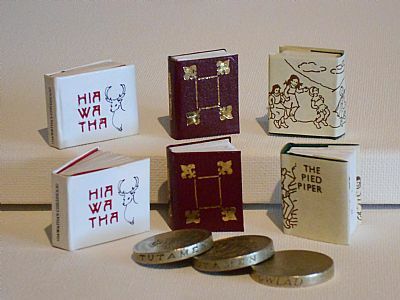 Some are Twelfth-scale books, some are Miniature Books, some larger. 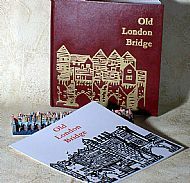 Some are illustrated by Frances Grant, and all are hand-bound using artificial leathers, book-cloths, and interesting papers. and the Scottish Poetry Library, also in Edinburgh. All of our books are available to buy on the SHOP pages on the left. Look the very air is shining! A beautiful short poem by Frances Grant, printed letterpress on our Adana hand-press from Carlton type. Sewn into light grey card covers in an edition of only twenty copies. 4 pages. 150mm x 96mm. Signed by the author and by the printer. To buy this book e-mail us at hestanislepress@gmail.com or use the Paypal button on the On line shop menu to the left. In “time out of mind”, our first full-colour publication, ten of John Horn’s best poems on the subject of “time” are presented alongside some of Frances Grant’s paintings. Some pages have decorations from relief blocks printed in turquoise ink. The A5 pamphlet is sewn into card covers with a gold stencil decoration on the front cover. Also known as a Cockney alphabet. The text pages are printed by letterpress in two colours and are accordion-folded, and then glued into a hard cover, closed with a ribbon. A quirky and original gift. From Gervase Markham’s “The English Housewife 1675, this booklet describes the making of rather large quantities of bread both for the household and for the household servants. A unique and amusing gift. From Thomas Hale’s “Compleat body of Husbandry” 1758, this booklet is very popular with the gentlemen for some reason! Letterpress printed in an edition of 100, this is an ideal small gift, or Christmas stocking-filler. A Classic text popular in the 1960's and still selling well. 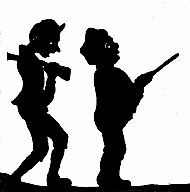 This mystery tale takes place around a tea-stall in London which is frequented mainly by Cabbies. When Sam, one of the Cabbies disappears, is it alien abduction, just a ghost story, or a case of amnesia? 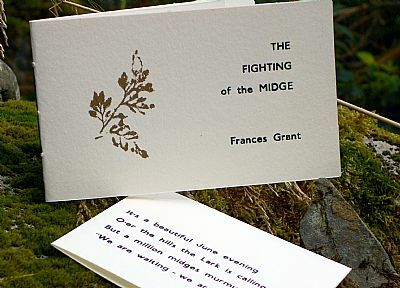 Written, and letterpress printed by Peter Grant, the book is illustrated by Frances Grant. Bound in white bookcloth with a cover illustration in two colours. Limited edition of 30 copies. A selection of poems by Arthur Wellings, inspired by the area around the Wirral Estuary. To buy this book e-mail us at hestanislepress@gmail.com or use the Paypal button on the‘On line shop menu to the left. 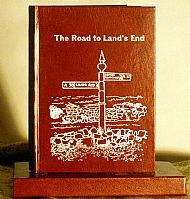 The text is letterpress printed in red and black, and the 21cm square book is illustrated with linocuts printed in black. Extra page decorations are printed in blue. All the illustrations were printed using a Victorian screw-press. Anecdotes of 21 towns and villages on the A30. The book is illustrated with silk-screen prints - printed in ochre. The cover decoration is by Frances Grant. A new translation of the Anglo-Saxon poem, describing the hardships of life at sea during this period of history. 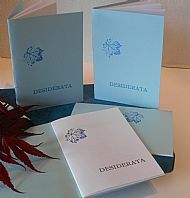 Letterpress printed in three colours, with a decorated cover. A new translation of the familiar Anglo-Saxon poem. Letterpress printed in three colours. Cover and Title page decoration by Frances Grant. An amusing poem about the Irish ‘simple life’ by Frances Grant, who also did the illustration for the cover. A6 poetry pamphlet, letterpress printed on an ADANA “eight-five”and sewn into Bockingford cover. Alexander Carmichael collected hundreds of prayers, blessings and poems from the Highlands and Islands, in the nineteenth century. These two beautiful poems – The White Swan and Song of the Swan - are perfect examples. The text is letterpress printed. Illustrations (by Frances Grant) are laser printed. Two illustrations plus a cover decoration by Frances Grant. This poetry pamphlet has been short-listed for the Callum Macdonald Memorial Award at the National Library of Scotland for 2016. We are waiting - we are waiting! An amusing poem about the dreaded Scottish Midge by Frances Grant. Letterpress Printed.Second edition of 35. Sewn into card covers. An evocative midsummer celebrationary poetry pamphlet by Frances Grant. Hand printed . 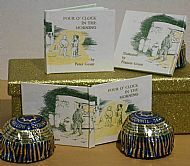 Second Limited edition of only 34 copies. Jesus sent His Apostles to all parts of the known world, and Thomas was sent by Jesus to India. At first he was reluctant to go, but eventually agreed. But he took with him the beliefs of Jesus and His family - beliefs which included the concept of a female/male deity. This thought-provoking laser printed booklet is hand-sewn into a letter-press printed cover and thermo-graphically enhanced. Extracts from this Apocryphal book of the Bible which describe the attributes of Sophia Goddess of Wisdom, ‘opening the door to eternal life, and thereby the attainment of happiness’. 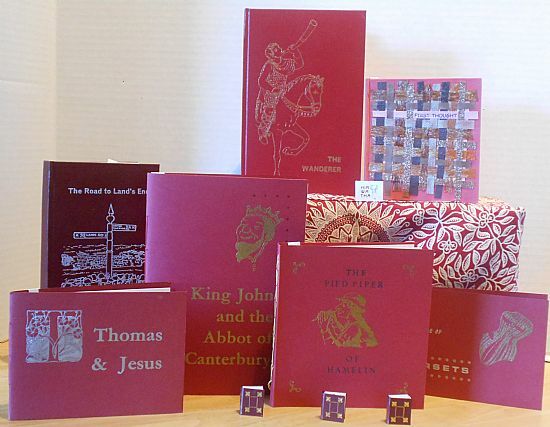 Originally written in Greek about 110BC, these extracts are letterpress printed in red and black with page decorations silkscreened in a third colour. Also known as “Perfect Mind” this is a Gnostic text similar to Proverbs where the Divine Mother is speaking as the Goddess Wisdom. Letterpress printed in red and black, marbled endpapers. Also called “Protennoia” this is one of thirteen papyrus scrolls found in Nag-Hamaddi in 1945. The poem is spoken in the voice of a female deity. The text pages are assembled so that they “pop-out” as the pages are turned. Bound in pink suede-effect book cloth. With over one hundred line illustrations, this 275 page book is digitally printed and perfect bound in a square 210 mm format. The cover also features a colour picture of The Earth Goddess, or Lady Wisdom. 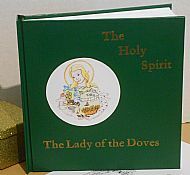 Lady Wisdom – the Lady of the Doves – was the Goddess believed in by the family of Jesus and Jesus’ followers. They also believed in the Father God El, rather than the God Yahweh, and this book attempts to tell the whole story. Independent scholar Frances J. Grant has spent several years researching, writing and illustrating this beautifully produced book. “I've just read your book - it's fantastic! Most fascinating, quite academic, and very rev-ealing!” Brenda Green, Author and poet. It had been noticed for hundreds of years that there were numerous parallel passages in the Gospels of St. Matthew, St. Mark and St. Luke, but it required the tenacity of Canon B.H. Streeter almost 100 years ago to extract the verses concerned and to re-establish that St. Matthew and St. Luke used St. Mark's Gospel plus an original text available at the time. Streeter referred to this original document as "Q". "Q" being a shortened form of "Quelle", meaning 'the source' in German. It is important to remember that many thousands of Jewish people were on Jesus' side of the arguement. The arguement, which clearly appears in "Q", was with the Jewish authorities. As these first writings were in use throughout the Roman Empire for at least the first thirty years after the death of Jesus, many of the congregation listening to "Q" would have been 'living witnesses' to Jesus Himself. So these writings are likely to be extremely accurate. These words were thought to be of such importance by St. Matthew and St. Luke that they obviously felt compelled to hide these words until someone like Streeter would realise their truths. Digitally printed 61 page booklet with commentary and illustrations by F.J.Grant. Three evocative poems by John Horn letterpress printed by hand on an Adana handpress. ‘A’ for ‘orses – ‘B’ for Mutton, etc. See if you can work out what they all mean? Accordion-fold which folds down to 50mm square and 25mm deep. Letterpress printed in two colours. Limited edition of only 30 copies. A beautiful poem by Frances Grant about the wonderful juxtaposition of the moon, Venus, a blackbird in the Damson Tree, and the rising of the sun. One illustration also by Frances. 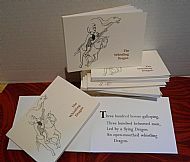 Edition of thirty copies. stands the Church of the Virgin Mary. is known throughout the World as the source of many miracles. This tale concerns a group of fishermen from the Greek island of Tinos who experienced a surprising miracle at first hand! The story was mentioned in Francesco da Mosto's TV documentary "Mediterranean Voyage" - this is what inspired us to make this booklet. This large Format booklet is Letterpress Printed and sewn into card covers. Pictorial endpapers on blue Canford paper shows the island of Tinos. Designed and illustrated by Frances Grant. So begins this wonderful tale by Charles Kingsley retold here by Peter and Frances Grant. The 21cm square format soft cover book is profusely illustrated with silhouette pictures by Frances Grant. Far away beyond the sea and across the land for many days - lies the vast country of Russia. Russia is very wide and has many faces, but blck across the heartland of Russia lie the forests. So begins Frances Grant's retelling of the Prokofiev Classic. 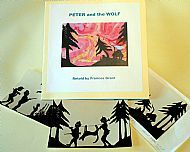 The sixteen pages of this digitally printed 21cm square soft-back book are illustrated with lively silhouette pictures - also by Frances Grant. A tiny twelfth-scale version of the poem. 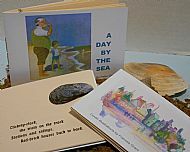 Only 22 mm high and 27 mm wide, this ever popular and well-known poem by H.W.Longfellow is letterpress printed from photo-polymer blocks in an edition of 200 copies. There are seventeen line illustrations by Frances Grant printed in dark brown. Only an inch high, the full text of Robert Browning’s poem has 21 illustrations, and a dust-wrapper by Frances Grant. Letterpress printed from photo-polymer blocks. Genuine recipes from 1882. Learn how Victorians roasted a Goose, boiled potatoes, and made white sauce amongst other things. 60 pages of text. Only 25 mm high.